Meet Silke, who has a 14-year old son and lives in Düsseldorf, Germany with her husband. 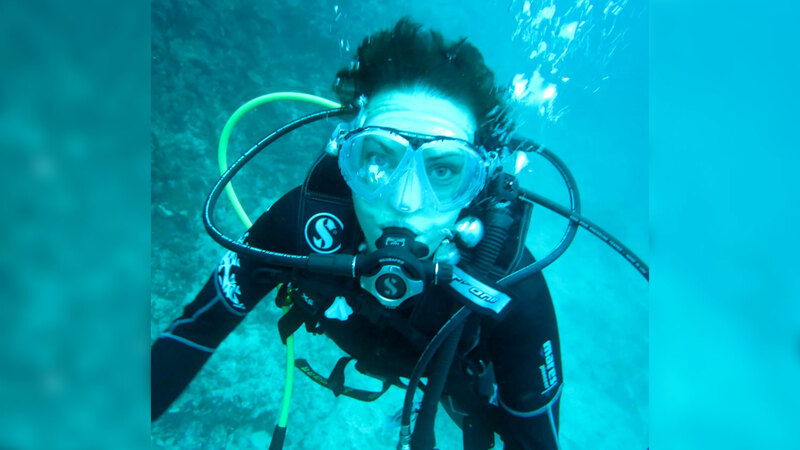 Silke enjoys reading English literature, scuba diving and traveling, and has lived with hearing loss for over 20 years. In this two-part series we will be sharing Silke’s hearing journey with you, including how her hearing loss developed, what options she explored, and how she found out about the VIBRANT SOUNDBRIDGE Middle Ear Implant twenty years later. The first time I realized that something was wrong with my hearing was over 20 years ago. It was just after a concert, when I began to hear a steady high-pitched noise that no one else seemed to hear. So I went to an ENT specialist and was told that what I was experiencing was tinnitus. I endured three weeks of “HAES infusions” without any apparent success regarding the tinnitus. At that time I didn’t realize that my hearing ability was actually deteriorating too. Last year I began to realize that my hearing had worsened again and that I sometimes felt isolated from other people. It really hit me during one of our CEOs’ speeches at work when the sound system broke down. I realized that I really couldn’t clearly understand what he was saying, but everybody else seemed to have no problem at all. However I still didn’t want to endure any more tests without a result or a solution, like what had happened to me 5 years ago. And so I didn’t immediately act on it. Then, in March last year, I got a really bad cold while my regular ENT specialist was on holiday. The cold got worse and so I searched online for a new ENT specialist. During the doctor’s examination, I was finding it extremely difficult to understand his questions. The doctor was surprised as he had just examined my ears and said that this difficulty in hearing could not be due to my cold. That’s when I told him about all the tests I’d had some years before. I told him how frustrated I was feeling and that I often couldn’t follow what people were saying when I was in a meeting. The doctor strongly recommended that I get more tests and for me to visit a clinic in Essen which specializes in surgery for the hearing impaired. He said it was imperative that we take action now as the ear can lose its ability to hear when it is not getting enough input. Nobody had ever told me this before! He could understand my frustration with having new tests, but he was very adamant, yet kind, about making me see why it was so necessary. He even scheduled a meeting for me with the specialist at the clinic in Essen. After the tests at the Essen clinic, my new specialist said that they would need to perform surgery to have a look inside my ear and find out what the best solution would be. He also mentioned another option to me—the VIBRANT SOUNDBRIDGE. The specialist said it may be a valid possibility in a few years’ time in case the first or second middle ear surgeries didn’t help and my hearing continued to deteriorate. I went home thinking about whether or not I should have the surgery to look inside my ear. I thought back on all the hearing situations I was feeling uncomfortable in. I couldn’t understand a normal conversation without concentrating very hard and trying to lip-read. I began wondering what it would be like to hear “normally” again. I talked everything through with my husband and we decided that I would go for the first surgery. The surgery went okay, but it didn’t have the complete desired effect. Although the surgeon mobilized the incus and stapes as planned, 5 months later my hearing had still not improved as much as he had thought it would have. The specialist then planned to perform a second surgery, a stapedectomy, which is surgery on the middle ear. He would insert a stapes implant made of titanium. He was confident that this second surgery would offer me improved hearing for the next few years. A week before my second surgery was scheduled for, I had some final hearing tests. The results left my specialist baffled. He ordered to have all tests repeated. After he read the results of all the new tests, he told me that the planned stapedectomy would not have the desired effect. He had discovered that the reason for my continued poor hearing after the first surgery was due to a combination of inner and middle ear hearing loss, which was different to his initial diagnosis. He told me that this would progress and lead to deafness. This stunned me for a minute. I asked if there was anything he could do. He then told me again about the VIBRANT SOUNDBRIDGE implant and explained in great detail how it would improve my hearing. I still had a few reservations about getting the VIBRANT SOUNDBRIDGE, but on the other hand, what were my other options? Doing nothing and going slowly deaf? Or, take the risk and hope it would work out okay? My specialist informed me about the surgery itself, and also demonstrated how my hearing would improve with the SOUNDBRIDGE. I was stunned once more—but this time not by fear, but by joy. My husband and son were the biggest support for me during this time, keeping me from despairing during the 6 month period between the first and second surgery. I talked a lot with my husband about the pros and cons. He was always so positive and reminded me of the things I would be able to hear again and do. One of my biggest concerns about the stapedectomy surgery option was that I would not be allowed to go scuba diving again. The opinions on being able to scuba dive after a stapedectomy vary a lot. This was something I asked my doctor as soon as he suggested the VIBRANT SOUNDBRIDGE as the alternative option. Finding out that it would be absolutely no problem at all to go scuba diving with the VIBRANT SOUNBRIDGE was another important deciding factor for me. So the surgeon ordered the VIBRANT SOUNDBRIDGE and luckily it arrived so quickly that I kept the same date for my second surgery which I had in November 2016. Don’t miss our sequel post next week when we share Silke’s experience post-surgery and her improved hearing with the VIBRANT SOUNDBRIDGE.